Hello and Happy Wednesday!! I hope you're staying warm in your corner of the world. We got 4" of snow today so the outside looks like a winter wonderland. It's so pretty but I'm also glad for the warm fireplace in our living room. :) I'm back with another challenge at Word Art Wednesday. This week we're focusing on Psalm 63:3, "Because thy lovingkindness is better than life, my lips shall praise thee." Dictionary.com defines "lovingkindness" as tender kindness motivated by or expressing affection. The Lord is good to us and shows us kindness as a way of expressing His love for us. I'm still trying to figure out why He would love me and He is being kind to me to show me how much He loves me! With this in mind, how could we do anything else but praise Him? I used scraps from a wintery 6 x 6 paper pad for my card today. I added lots of sparkle by dotting random snowflakes in each of the 3 snowflake patterns and random intersections on the plaid with Stickles glitter glue. The hearts were coated with Nuvo Crystal Drops. I'm still working to get my mojo flowing again after being out of my craft room for so long so this sketch by Reverse Confetti was just what I needed. Thanks for stopping by today. I hope you'll be able to take time to visit the Word Art Wednesday blog to see the rest of the DT inspiration and to pick up your free digi. I love the bright and cheery colors you used on your lovely card along with the little hearts! So happy you linked this up to the Cropstop blog this month! Thanks for joining us over at The House That Stamps Built as well -- always a pleasure to have you play along! What gorgeous papers and lovely way to use up scraps. 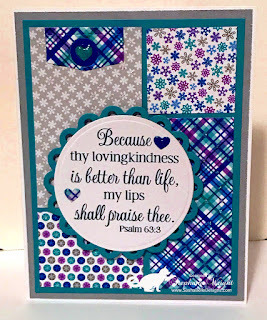 thanks for sharing with CHN patterned paper challenge. Love the patchwork look on your card. Great way to use all theese scrap pieces laying around everywhere... Thank you so much for entering our ATG challenge at Through The Craft Room Door this week. Looking forward to see you again next challenge. Beautiful!! Love the papers you patchworked together; so fun!! And the sketch is perfect for using that lovely verse. Thanks for playing with The House That Stamps Built.